Pretty good start and made good progress down the Solent in time to get through Hurst before the tide turned and then it all went wrong. Managed to get out past Bridge before the wind died and then drifted for about four hours out the back of the Island. Did contemplate trying to get back inshore out of the tide but didn't fancy risking getting sucked back into the Needles Channel. Wind eventually picked up and headed direct for the finished as by now we were so far offshore. 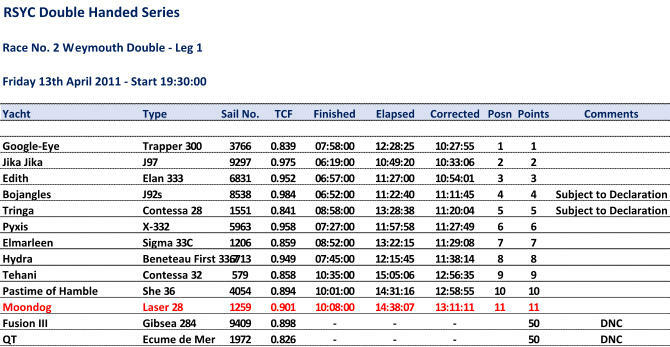 Couple of other boats about as we finished but most of the rest of the fleet hadn't had the wind hole hence our last position.